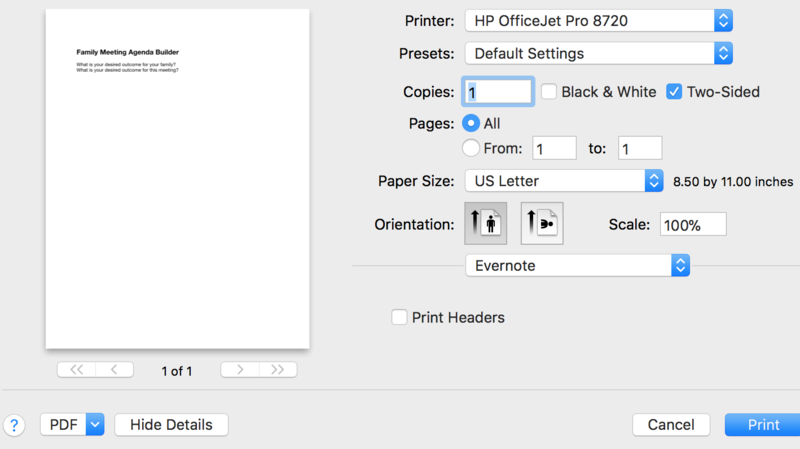 Absolutely vital if you use Evernote to print anything. I personally hate it if the title prints. I'm using "technical" titles for my notes, so that I myself get an overview over my stuff. When I print a note, I print it for others and if they see my cryptic titles, it's not what I want to communicate. I believe printing is like communicating. Printing is different than just using Evernote and taking some notes. Printing is giving. Hence I'd like to control my communication. The titles should be treated separately from the content. We need the option "Print note title" either in the print dialog or globally in Evernote preferences. Just as a reminder to the readers here – this feature request is not about having the note title print (it does, as of Version 6.12.3) but the request demands a choice to print the note title or not to print it (hide it). Yeah, as I see things, there are people (like me) who need the note title printed and others like you who don't want that. So, please, Evernote: give us the option in the print dialog! This is broken again in 6.13 ? Now no title shows at all but also, no headers show if "show headers" is selected in print dialogue. Confirming that, in 6.13, Headers do not print when <Print Headers> is checked on Print options. The <Print Headers> checkbox therefore performs no function. In 6.13, Titles do not print. Users expect to be able to print or suppress Headers and Titles in almost any consumer software product. Each of these malfunctions impair the utility and value of the Evernote product. When will this be fixed? Pretty damn basic feature. Happy to start my own thread on this, but I just upgraded to 6.9 and freaked out when I re-opened. Most of my notes are written with the apple pencil on an iPad Pro, and the new version drastically distorts them when viewing those notes on my Mac. It's kind of a big deal. The reason I include it here is because it is related to note printing. When I go to print these same notes that are displaying as enlarged and skewed, to my horror it prints exactly as it displays in my Evernote window (as opposed to how I actually wrote or drew) when the note was created. Apologies if this I'm not adequately describing it. I'm a newbie in the forum. I've attached a screen capture of the problem below. Whether in this thread or another - HELP ME Evernote Team!!! Happy to start my own thread on this, but I just upgraded to 6.9 and freaked out when I re-opened. Most of my notes are written with the apple pencil on an iPad Pro, and the new version drastically distorts them when viewing those notes on my Mac. It's kind of a big deal. The reason I include it here is because it is related to note printing. When I go to print these same notes that are displaying as enlarged and skewed, to my horror it prints exactly as it displays in my Evernote window (as opposed to how I actually wrote or drew) when the note was created. Thanks - will do. Sorry for the distraction/hijack. Please add the print title feature back. I really found that useful and would like to have it back. Thanks! Yes, it is very needed and I support the development of this option. PLEASE BRING BACK PRINTING WITH TITLES!!!!!! I'm a bit confounded how this has not been a standard feature for years? I'd think that the norm would be to want a Note title to print. Without it, you have to read the note for the context of what the note is for. The emphasized title has also been dropped from emailed notes, and now only appears in the subject line. I like DTLow's suggestion for a toggle option to print/not print the note's emphasized title, and hope that this could apply to both printed and emailed notes..
Who on earth would kill a feature like "print title"? While our school continues to use Evernote (yet to be determined as we need notebook password protect option to continue long term and have contacted the Evernote team), we print many notes to PDF and the ability to NOT print titles (currently, if left blank, it by defaults prints: "Untitled") is important to have. 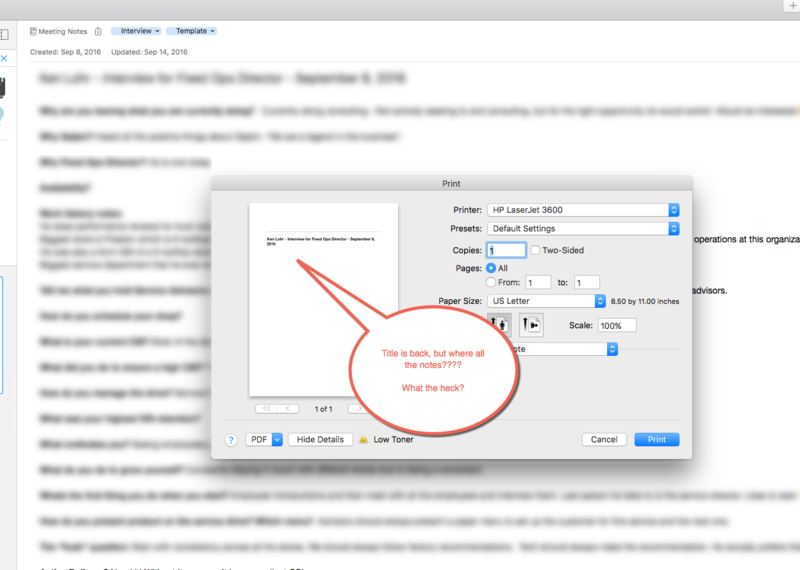 If we leave the title blank, when printing to PDF it should be blank. If we type in a title, it should print that title. Simple. If we leave the title blank, when printing to PDF it should be blank. If you try to use a blank title, Evernote will insert "Untitled"
Thanks but no correction is needed - I suppose you didn't ready my post entirely. Now all I get when I print is a line at the top of the page below where the titles (should?) used to be! Please EN team, please, please at least this back to there it was in 6.12.x! When will title printing be fixed/added as option/put back? I do need the title to print. Its part of my workflow. And that new line looks very odd at the top. Lines are for visually separating content. What is that line separating? Hmm, I see I'm not updated to that version. Thanks for chiming in, I'll check that! Oops. Looks like I'll have to wait for the official release, but it gives me hope. Thanks.